As the 41st edition of the Dakar Rally is nearing its conclusion, surprises continue to pop up in the penultimate stage of the competition. TVS-Sherco rider Michael Metge, who stood 24th overall after finishing stage 8 in 10th place, brought home Sherco's first stage win by claiming victory in stage 9. Just 2 minutes behind Metge, HRC rider Daniel Jager settled for second place while Pablo Quintanilla (Husqvarna) rounded off the top three. However, in the overall classification, Metge has been handed a 3 hour 23 minutes penalty which has sent him down to 22nd place. This puts him just ahead of his brother Adrien Metge, who holds the 23rd spot. The only remaining Indian rider in the competition, Aravind KP, slid down in stage rankings as he finished stage 9 in 55th place. However, his overnight overall classification of 39th remains unchanged. Hero MotorSports riders Oriol Mena and Joaquim Rodrigues (JRod) continued with their razor-sharp focus while heading into the stage. As they are not the contenders for the Moto Class crown at the moment, Mena and JRod have purely been focussing on continuing their defence by having incident-free runs and they managed to secure solid positions at the end of stage 9 as well. Mena secured a 10th place finish while his teammate finished in 18th. The day was a bit troublesome for JRod as he was battling immense back pain caused by his crash in stage 8. In the overall standings, Mena is placed at 9th while JRod sits a few spots behind in 17th. 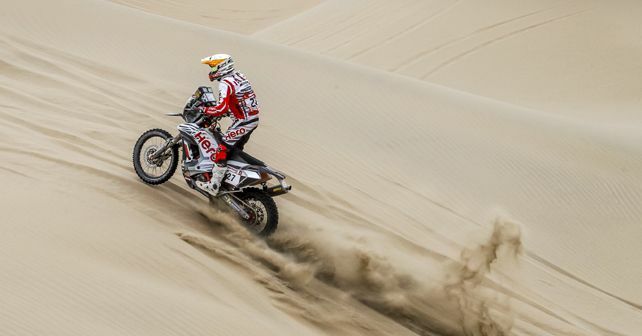 The stage, however, turned out to be deadly for many other prominent names as Adrien van Beveren (Yamaha)and Stephane Peterhansel (Peugeot) succumbed to the extreme sand dunes, which marked their exit from the competition. With just 16km to go, van Beveren suffered an engine failure which ruled him out immediately. Meanwhile, Peterhansel's co-driver sustained a back injury caused by an extreme landing off a sand dune. As the co-driver had to be taken to a medical centre, Peterhansel bit the dust as well. Privateer Loeb also struggled after breaking two gimbals on his Peugeot right when it looked like the stage had his name written all over it. The man from Alsace lost an hour and will have to settle for third place in Lima. Taking advantage of this, Nasser Al-Attiyah (Toyota) claimed victory in stage 9, making it his third stage win this year. The Qatari now just needs to wrap up his masterly cool-headed performance in Lima tomorrow. He has a comfortable lead of 51 minutes and 27 seconds over Nina Roma (Mini), who is currently second in overall standings. While the fate of the Car class might seem more or less sealed, it's the Moto class which has come right down to the wire. Current overall Moto leader Toby Price (KTM) has a lead of only a minute and two seconds over second-placed Pablo Quintanilla (Husqvarna). Price's teammate Matthias Walkner is also in the title race as he is in third place, behind Price by just 6 minutes and 35 seconds. The relatively short final stage of the 2019 Dakar Rally will run a 112km loop in Pisco, before finally moving on to Lima for the final celebrations.